An Energy Saving Kettle – you bet! You are here: Home / New Ideas / An Energy Saving Kettle – you bet! From the land where tea is the most important beverage and can solve problems from depression to world peace comes an innovation in energy saving.. Frankly , I am astounded no-one in the UK thought of this before. It’s called Vacuum Kettle and it really does work! If you think about it, how many times a day do you boil and then have to re-boil the kettle to get that piping hot water for your tea or coffee? Well, that could add up to some serious kilowatts over a year! It’s funny that when we think energy saving,how many of us pay attention to that little portable geyser called the kettle? Kettles are high-consumption appliances. In an attempt to go greener, many people fill the kettle with just the amount of water they need, but that still leaves them with the problem of firing it up an average of four times a day. 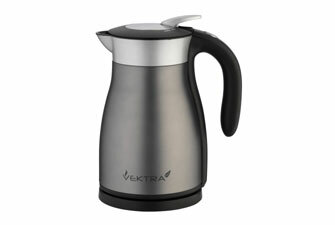 The Vektra Vacuum Electric Kettle attempts to solve this problem by combining an electric kettle mechanism with a vacuum jug, which keeps water hot for up to four hours after it’s boiled. It’s not perfect yet – the claim is that after two hours the water is still at 80°C, and after four hours it’s 68°C. Does the energy saving kettle work? Testing two kettles, a conventional one and the Vektra Vacuum energy saving kettle yielded the following results. After boiling the kettles,the temperatures of the water in the vacuum kettle and a conventional one were measured , two hours after boiling the same amount of water in each. Water in the energy saving kettle was 65C, whereas water in the conventional kettle was 38C. This is a signifcant difference as an energy saving kettle capable of keeping water hot over two hours would save considerably over a year’s use. Bested only by the tumble dryer, the washing machine and the vacuum cleaner in the energy-munching stakes, an energy saving kettle can halve your (kettle-based) energy consumption. With a vacuum energy saving kettle, a reduction in energy consumption comes without adding anything extra to your daily routine. Typically, reducing your carbon footprint involves making an effort. It saves you time.According to (very approximate) statistics, the average kettle takes just one minute and 27 seconds to boil enough water for two cups of tea. According to statistics, the Brits boil a kettle on average 1,378 times a year, which means over a year they spend more than 33 hours waiting for the kettle to boil. With an energy saving kettle you could cut that wait down to two working days a year. And just to add on a bit more ,it stays cool on the outside, so you won’t burn yourself if you accidentally grab or bump into it, even just after it boils. The cost of the energy saving kettle – it could boil your budget! At present , you would be paying around £75-£85 – that’s POUNDS for one energy saving kettle, that’s around R1300-00 for a KETTLE at the current exchange rate. However, consider this as well..that if you were cutting down the amount of times per day you boiled the kettle at 800W per ‘boil’. If you were able to cut that down to twice per day, that would halve your energy usage on the kettle. In a year, you would use around 1168 kW (boiling it at 4 times per day) which is around one month’s electricity usage for an average home. If you cut that in half, think about saving half a month’s payment on your electricity account! Not only that, but you would save you time waiting for the boiling kettle as well! So, the big question is , would you pay R1300-00 for an energy saving kettle -but you would recover that in 24 months? So, then next time you are thinking about ways to reduce your energy usage,think energy saving kettle!